BREAKING NEWS: Senatorial candidate Nancy Binay of the United Nationalist Alliance (UNA) topped the latest survey conducted by Pulse Asia from March 27 to March 30, 2013. Vice President Jejomar Binay’s daughter got a stunning 70 percent rating as she toppled re-electionist senator Loren Legarda from the number 1 position. Legarda dropped to No. 5 with 46 percent. 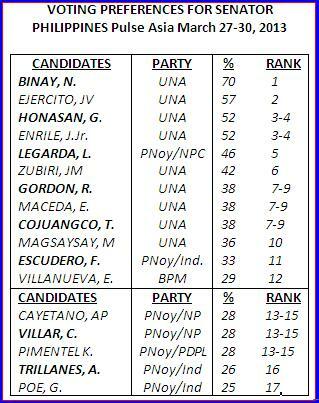 UNA also dominated the pre-election survey with 9 of its candidates in the Magic 12. Team PNoy was the biggest loser as only two of its Senate bets made it to the potential winners’ circle. The most surprising performer and biggest gainer was religious leader and televangelist Bro. Eddie Villanueva who leapfrogged to the No. 12 spot from 23rd place in the previous poll. He also commended the efforts of UNA bets to reach out to a far greater number of Filipinos. “Pinaghirapan nila ito. Makikita n’yo naman ang dami ng taong dumadalo sa aming campaign sorties. Patunay lamang na solido ang suporta ng mga kababayan natin sa UNA,” Tiangco added. Team PNoy declined to comment on the results of the Pulse Asia survey. Ben Evardone, the coalition’s spokesperson said they have yet to receive a copy of the survey. Sought for reaction, President Aquino’s spokesperson Edwin Lacierda just smirked. A total of 2,000 respondents nationwide were polled. The survey had a margin of error of +/- 3 percent. Only Pulse Asia employees were involved in the sampling, field work, and data processing and analysis. No portion of the study was outsourced. For transparency, Pulse Asia revealed that the latest survey was commissioned by Vice President Binay, former President Joseph Estrada and Senate President Juan Ponce Enrile. Pulse Asia also released the results of its latest trust and approval ratings survey. President Aquino and Vice President Binay continue to enjoy high trust. They got 67 percent and 71 percent, respectively. 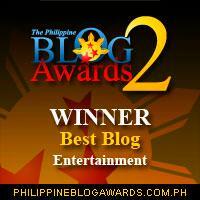 But both officials have been edged out by the most trusted Filipino today: “Sir Chief” who got 90 percent. The trust ratings of Senate President Enrile, and presidential sisters Kris Aquino, Ballsy Aquino-Cruz and Pinky Aquino-Abellada also plummeted. 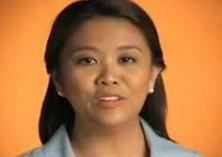 In contrast, Viel Aquino-Dee’s trust rating was unchanged. worked for a political poll/market research firm before and if the survey is commissioned by someone who wants to be “NO.1” on his own commissioned survey, then they will manipulate the questionnaire. baka push poll ang structure ng questions sa survey nila. pulse asia and sws will not release their questionnaire, only the results. negosyo yan.